VINTAGE APARTMENT IN FRONT OF SANTA MARGHERITA LIGURE WONDERFUL VIEW! Vintage aparment where I grew up and I spent my childhood with my family. It sleeps 4 or 5 people and it is located in front of Santa Margherita Ligure 10 minutes by car and 15mins by bus. From the kitchen balcony there is a speechless view there you could relax and have breakfast and enjoy your stay. living room with two sofas and two bedrooms. Masterbedroom with double bed and balcony overlooking the mountains. Second bedroom with two single beds that we can join to create a double bed. Little bathroom but inside you will find everything you need. FREE PARKING AND GARDEN AT DISPOSAL OF OUR GUESTS YOU MIGHT SHARE IT WITH OTHER GUESTS AS WE RENT AN OTHER APARTMENT. WE LOVE TO SHARE AND WE HOPE YOU TOO. Reliable buses will lead you to the town center and from june, every week ends 3 free buses to get to the beach and from July to August every day and until middle of September only during week ends. In front of our house a wonderful foot path, among olive trees, will lead you in 30 minutes to Santa Margherita Ligure. Perfect to explore the surroundings. We are in the heart of Portofino National Park and from here you can easily reach Portofino, SantaMargherita Ligure, Camogli, Genova and last but not the least CINQUE TERRE. The best way to visit the surroundings is by bus. SAN FRUTTUOSO you can reach it on foot starting from our village or by boat from Santa Margherita. PARAGGI PORTOFINO on foot from our house taking the foot path among olive trees or you can reach the Portofino regional Prak and explore the wonderful footpaths in the wood. CINQUE TERRE by train from rapallo. CAMOGLI by bus from opur house at 30 meters. CHIAVARI by bus or train every first weekend of the month there is a really nice antique trade. TOURISTS TAX 1,50 euro PER PERSON PER DAY CHILDREN UNDER 15YEARS OLD DON T PAY. IF YOU LOVE COOKING WE WILL BE GLAD TO ORGANIZE A COOKING LESSON WITH YOU AT A LITTLE PRICE AND AFTER DINNER ALL TOGETHER! I am about to describe myself hoping to give you a complete self poltrait! I am Lucia a dinamic middle age madam even though sometimes I have one’s head in the cloud. Last but not the least I always want to be up-to-date about everything!!! For example; Now I am learning english to communicate with my guests. I have to face up that it is not easy to learn it but nothing is impossible. To my guests, who loves and want discover Liguria, I prepared some guided tour in order to not miss anything! Cooking is my passion … When I cook all my senses are implicated. I am gourmand and I cook well too, my family affirm. I would like to, during this encounters, give some ligurian and italian cooking lessons to my guests …in addiction we can speak about wines thanks to my son-in-law Guido,who is very fond of them. I would like to do too many things in my life and I have a lot of ideas may be too many for my ages but I feel like I have half of them. We choose to rent the third floor of our house where we grew up and which reminds us a lot of happy memories. Where we want to give the opportunities of our guests to stay and live with us in order to share our traditions, our tastes and the beauty of our region! Our house is located in the heart of Liguria in front of the Gulf Tigullio from where it is possible to reach the most beautiful touristic places of the nearby. I love my region and I think is perfect in every seasons: during autumn is warm and you can taste wine and our olive oil, during winter is calm and temperate, during spring our region is in bloom and hot is getting on the way and in summer sea and people whisperings are the attraction . In order to have a wonderful holiday you can spend some time with us so you will arrive as guests and you will depart as friends! Our house is unpretentious. It has not been built for tourists but for our family and during the years we tried to improuve it. The only thing that didn’t change is our wondreful view that you can admire from our kitchen balcony. Moreover you can relax amoung olive trees and in summer you can drink a glass of wine, some Focaccia and pizza home made thanks to our wood oven a good way to get acquainted with us! But for us the most important thing is to share our simplicity and openness with you all! We had an amazing time here with beautiful views and it was very clean. The owners were so very kind and very helpful! This is a fantastic place to stay with spectacular views . The owners are lovely people that made our stay so special and will hopefully remain good friends. There are many places nearby to travel to ,we used the bus mostly even though we had a car . The cooking lesson and eating the home cooked food afterwards was an amazing night ( that should not be missed ) !!! Perfect base to explore Portofino, Sestri Levante, Cinque Terre for the automobilists. Quite distance to the coast without the car. 10-15 minutes by car on a mountan road. Nice apartment on the second floor with the fantastic view. Friendly owners always ready to help. Very much recommended for the large family or two couples. When we arrived to Lucia's Grandmother's House, Lucia met us at our car and took us inside to show us around and she answered many questions. She was warm and helpful and we loved the apartment! The bed was wonderful; along with all of the windows and two balconies. The balcony off of the kitchen overlooked the most wonderful view of the Tigullio Gulf and the city of Santa Margherita. We cooked most of our meals in the wonderful kitchen and walked to the center of town by taking the path down the side of the hill. We rode the bus back to the apartment which was easy to do from the bus station in Santa Margherita. We had dinner at the Pizzeria just down from the apartment and it was great with reasonable prices. We would love to return someday and take the cooking classes provided by Lucia. She was delightful! Thank you for a wonderful time in your Grandmother's house. When we were planning our trip, we had originally thought about staying in Portofino and were so thankful that we had decided on this location. The road to Portofino was narrow and congested and we would have felt stranded in Portofino for the three days while in Ligure. We highly recommend staying at this apartment! It was a pleasure to meet you!! We love making new friends ...we wait for you again! We will do a wonderful cooking lesson all together!!! Perfect, what more can I say? We stayed with Lucia, Guila Guido Duna and Moppi in August this year. What a lovely family they are, no my facebook friends! We had the best week ever there. Nothing was too much trouble for all the family, even picked us up and dropped us back at the train station. On the way from the train station Lucia even stopped at the supermarket so we could get some provisions, so thoughtful. We were shown around the apartment and everthing was explained so well. We enjoyed the village of San Lorenzo so much even joining in the festival which was on during the first few days we were there. The accommodation was lovely, clean and everything needed for a wonderful holiday. The views from the balcony on two sides is amazing especially at night. The walk down to Santa Margherita is a must do. The ease of access to the Cinque Terre is great. We had a lovely evening with the family overlooking the harbour from their backyard. 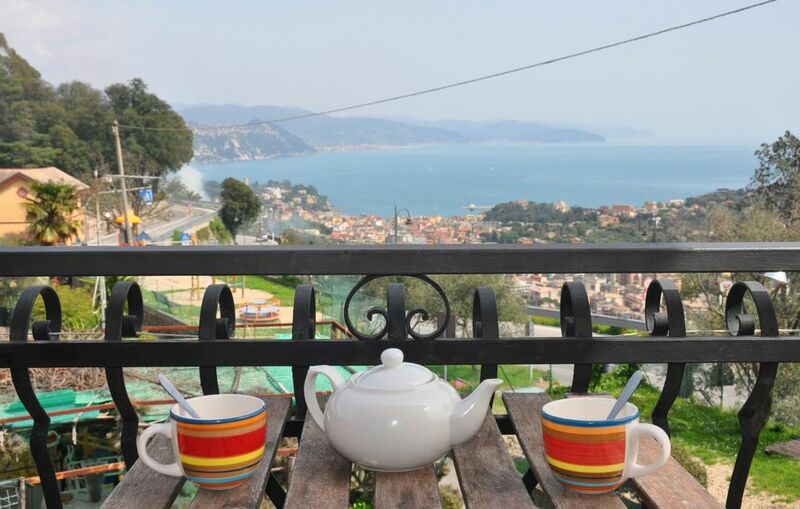 We thoroughly recommend grandma's house for your stay in Ligure. Love to all. Our house is nestled in the Park of Monte di Portofino, facing the Gulf of Tigullio, for those who enjoy walking Form the apartment can be reached on foot or by car,to amuse the beautiful trails of the park, and 10mins'drive the sea of St. Margherita Ligure, Rapallo, Recco and Camogli. Portofino is 7 kms far. S. Margherita Ligure, like many other tourist sites is reachable on foot. Genoa with the Aquarium, the Portoantico magnificent palaces and The Historical UNESCO World Heritage site is 30 km. The Park of 5 Terre is easily accessible by car, boat or train. Bus service every 40 'to tourist resorts mentioned. pour des meillleures explications contacter le proprietaire on poudra trouver la perfection pour vous.